I’ve been a loyal user of Firefox for years and plan to still use it as my secondary browser (and will use it regularly for Zotero). But Google’s new browser, Chrome, has really impressed me and I’m going to start using it as my primary browser for email, surfing the web, and every day online activities. Why is it better? It’s faster, does a better job rendering flash on Linux, doesn’t require restarts to install extensions, and isolates tabs, so if one crashes it doesn’t kill all of your other tabs. In short, Chrome has become a better browser than Firefox for everyday browsing. I had held off switching to Chrome for several months because I was hoping someone would create a Chrome extension similar to clippings for Firefox. I’m still hoping someone will, but I figured out a way to work around it on Ubuntu Linux. It’s not for the faint-of-heart or novice computer user, but it does work, and works quite well. Basically, what I’ve done is installed some software that allows me to paste text into any window, unlike clippings, which only let me paste text into Firefox. In here, you can create the key bindings to generate the text you want. This involves 6 steps. A new line in the list of keybindings will appear. Select it. I don’t know that the name you choose here is particularly important, but you should probably make it something you’ll recognize. 3) Set the key binding. 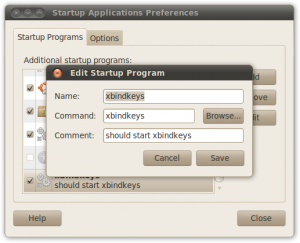 the xbindkeys GUI includes the ability to capture key combinations. All you have to do is press the “Get Key” button, wait a second for a small window to pop up, then press the desired key combination (e.g., Control+Mod2+Mod4+1). The GUI should capture everything for you correctly. The key combination will be coded into the language xbindkeys understands and will be put in the “Key:” field (e.g., Control+Mod2+Mod4+1 | m:Ox54 + c:10). What all of the code in the “Key:” field means, I’m not sure, but some of it is explained in the actual configuration file (which you created above; it’s located here: /home/your-user-name/.xbindkeysrc). 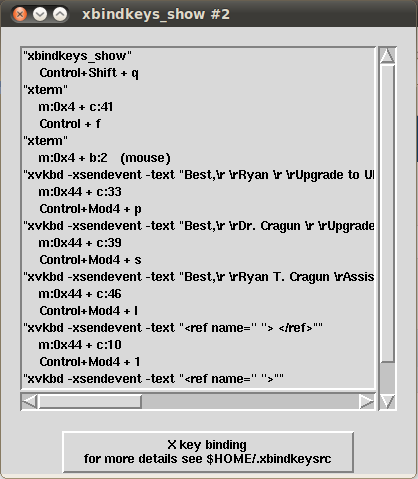 The first part “xvkbd” opens the xvkbd program. The second part “-xsendevent” tells it to send an event to the X window. The third part “-text” tells it what type of event – text. This will close the program, but it will also make sure that everything you just typed in will be saved in the configuration file. I have 5 different keyboard bindings for text I use regularly, 3 email signatures and 2 other text snippets. I created the first email signature, then started on the second and the GUI crashed, losing all my work. So, just hit the “Apply” and “Save & Apply & Exit” button after every keyboard binding you create just to be safe. 6) Test it. Open up a file or browser and try your keyboard combinations. If the text is pasted in – voila, you’re done. If not, well, you did something wrong or, well, who knows. The nice thing about this approach is that it is browser agnostic – it will paste your text into any browser or any other text input box for that matter. This isn’t all that important to know, but it is a nice little feature. very nice, just what I was looking for, very detailed. I also had the same problem about moving to Chrome…. Thanks a lot!! I haven’t run into that problem, but I’m guessing xvkbd can handle characters from other languages. I looked on the main information page for xvkbd (see here: . It does support alternate keyboards. If you type “xvkbd” into a terminal, it will pop up the virtual keyboard that is used to enter the text. In the bottom left corner there is an “xvkbd” button. If you select it, you’ll see an option to “change keyboard layout”. You can select “Spanish.” That may help. I use it for some of the more complicated things I paste regularly. I also included D3 and D1, which are “delays”, at the beginning (300ms) and before every dead key stroke (100ms), because without them, the special characters (ñ, é, ü) appear at the beginning of the sentence. This might be a local performance issue, but oh well…. I have no clue how to make this work with other special characters, like portugese, greek or german, I leave that for others to look for. I’m glad you found a solution. I figured it must be possible, but I had not run into that issue. Your solution will be available to everyone. Thanks for posting it!